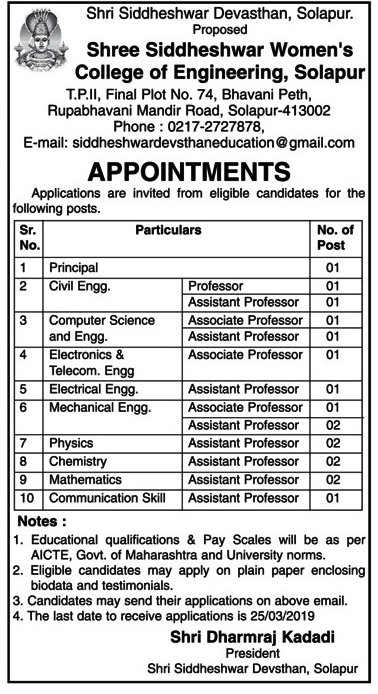 SSWE College Solapur (Shri Siddheshwar Women’s College of Engineering Solapur), Solapur published a new job notification for Principal, Associate Professore & Assistant Professor Posts. The recruitment is for total 17 Vacancies. The willing candidates are informed to see the latest notification March 2019. Last Date of offline application is 25-03-2019. For More details of SSWE College Solapur Recruitment 2019 Read Below. Interested & Eligible candidates can send their application along with all the necessary documents and testimonials to Shri Siddheshwar Women’s College of Engineering, Solapur. Application starts offline 16-03-2019. Last Date of application is 25-03-2019.